We have the mounting rail of the part # FR51322 available separately as part # CAM57268. The Faulkner BBQ Grill # FR51322 that you referenced uses a standard female low pressure quick disconnect fitting that is seen on RV propane applications. A common adapter used with this kit is the hose part # 100304-60-MBS which has a male quick disconnect and a female flare at the other end. It sounds like you are looking for a regulator that sits in-between your propane tank and the quick disconnect on your Faulkner BBQ Grill like part # FR51323. We actually have this listed as part # CAM57629 on our site. This connects to a standard 20 lb or 30 lb tank and has a quick disconnect fitting that your grill can attach to. The regulator changes the pressure of your propane to low pressure so that it is compatible with your grill. If your RV propane supply already has a quick connect then hose # CAM57280 is the one you would need for grill # FR51323. This hose is 3 feet long so you will need to keep the grill close. 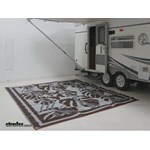 The Faulkner 9 FT x 18 FT Sahara Brown RV Mat, # FR48934, measures 1/8 inch thick and weighs approximately 14 lbs. 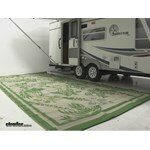 Carrying and storage bag # FR48829 should accept a 9 x 18 foot RV mat such as # FR48934. 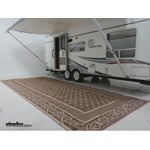 The carrier will accept one 8 x 20 foot mat so a 9 x 18 should also fit. You will have to roll/fold it up tight though. 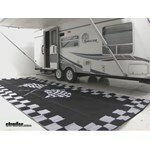 We do offer a bag that you could use with the Faulkner RV Mat # FR45638, but it does not come with one. For that you would want the part # FR48829. 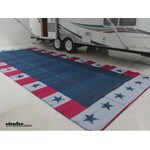 I went out into our warehouse to grab a Faulkner RV Mat # FR49599 to measure it and found that when it is folded up it measures 32 inches long by 10-1/2 inches wide and 7 inches tall. 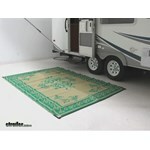 I attached a picture that shows the rug folded with the dimensions on it. Basically it is folded in thirds long ways and then folded like an accordion from there. The mat weighs right at 11 lbs. The regulator on the Faulkner BBQ Grill, part # FR51323 has a quick-connect fitting that attaches to the grill included. The hose I recommend to use with the regulator on the frill is the Camco Propane Hose Assembly, part # CAM59825. This hose is 12-ft long and one end attaches to the regulator on the grill and the other end attaches to the propane tank you are using. The # FR51323 grill comes with folding legs that make this grill freestanding. The Faulkner Carrying and Storage Bag # FR48829 that you referenced is designed for carrying 8 x 16 inch mats like what you have so it would work well for you. The internal dimensions of the bag are 14" tall x 37-3/4" wide x 7" deep. 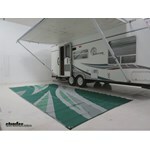 The Faulkner RV Mat # FR48703 can be folded, and since it measure 20 inches in length it would be 10 inches when folded. The Faulkner Stainless Steel Propane BBQ Grill # FR51323 does not include a cover. We do not offer one made specifically for it but we do have many grill covers including the cost-effective Classic Accessories # 052963539127 which fits grill carts up to 60-inches long. It will be a fairly loose fit on the Faulkner which measures about 22 x 23 x 17. 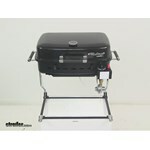 Another option you might prefer is the Classic Accessories Grill Top Cover # CA55053. This smaller cover is 36-inches long for a more snug fit. 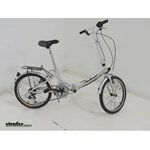 We offer the Faulkner # FR82085 folding bike in Silver, and a case isn't available. A bungee cord isn't required, but it will help hold the halves of the bike together and make it easier to load and unload the bike from a vehicle. The Faulkner BBQ Grill - RV Mount or Freestanding Propane - Stainless Steel, # FR51323, weighs 22 lbs. The Faulkner BBQ Grill measures 16-1/2 inches long x 13-5/16 inches deep and will work with disposable propane bottles, a portable tank, or your RV's propane supply. 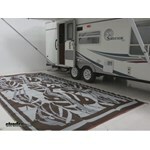 We do have many styles of RV mat from Faulkner in your preferred 9 x 12-foot size and all can be seen on the linked page. However, the particular summer waves design of item # FR46258 is not offered in that smaller size. The 9 x 12-foot product options include Independence Day-themed # FR46503 and the Finish Line-themed # FR48708 plus traditional rug-style patterns like # FR48702. Anything black laying in the sun is going to get warmer than something white. 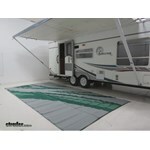 The Faulkner RV Mat part # FR46258 has two sides though. One is primarily black and one that is primarily gray. When in the hot months you could use the gray side and then during cooler months switch to the black side if the mats was to generate more heat that you desired. I called my contact at Faulkner and asked about the weight of the RV Mat, part # FR46363. They told me the weight of the mat is 14.99 lbs. This is a Burgundy mat that measures 8 x 20 feet, is constructed of 1/8 inch thick lightweight polypropylene, and has tie-down loops at the 4 corners that helps when you want to secure it in place. We are always looking for ways to improve our website and offer as much information as possible for our customers. Ideas and feedback are greatly appreciated and I will pass this request on. Thanks! I spoke with my contact at Faulkner and the RV Mat, # FR48701, that you were looking at measures 1 ft x 3 ft x 6 inches when folded in it's package. If there is another mat that you are interested in, please let me know and I will try and obtain it's folded measurements for you. Assuming the dogs are just walking on Faulkner RV Mat # FR48709 and not intentionally scratching at it the mat will hold up well. 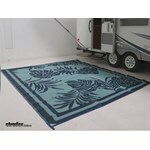 Outdoor mats like this are generally more durable than standard indoor rugs and mats. The material is 1/8 inches thick but if a dog was determined enough it could probably tear it up but the same could be said for any mat I suppose. I have linked a video review for you.